A hernia is when there is a rip/tear in muscle tissue that causes a portion of the abdomen (particularly, the intestine) to bulge through. This causes pain when standing up, moving the abdomen, or any kind of tension on the abdomen including coughing, sneezing, laughing, bending over, picking up objects, etc. 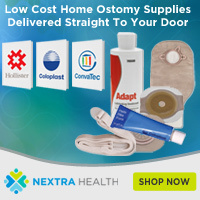 Having a stoma can develop into an ostomy specific type of hernia called a parastomal hernia. Since a Stoma passes through the abdomen, it can compromise the strength of the muscular abdomen wall. These weakened muscles can come away from the stoma, weakening its integrity and causing the intestine to bulge. Coughing, sneezing, heavy lifting and being overweight all put pressure on the abdominal wall & a stoma. Over time, muscles can weaken to the point a stoma begins to protrude and push out due to the pressure of the guts behind it. There are many possible origins for parastomal hernia to develop. Some are related to surgery and a poorly placed stoma or a developing infection around the border. Other causes are related to an individuals health, such as being overweight, heavy lifting, or any kind of physical strain, or a combination of these factors. How common is parastomal hernia? In the 1990’s, the United Ostomy Association found that a hernia is one of the most common complications for Ostomy patients. 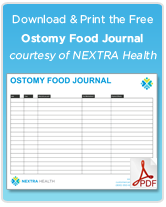 Ostomy hernias happen to about 30% of all stomas. It’s more common with Colostomy than Ileostomy and Urostomy. How is Parastomal Hernia treated? Surgery is the most common repair for any type of large hernia. Typically, if the hernia is not recurring, doctors will recommend a Hernia Belt and appliance changes before recommending surgery. A hernia belt is designed for individuals with small hernias or those where surgery can be risky or further compromise one’s health. A hernia belt is a firm, wide belt that helps support the stoma and muscle tissue around it externally. 1) To repair the muscle tissue around the stoma (either with stitching or mesh). 2) Create a new opening in a healthy spot and close off the old one. In some cases, Option 1 isn’t applicable; either hernia is too large or the surgery is too risky. And some surgeons will choose to re-locate the stoma first and install mesh if the problem persists. However, today, often a mesh is implanted instead of stitches. This is the ideal method of repairing a hernia. A mesh is laid across the herniated muscle tissue, helping to hold the muscle together and increasing its strength & integrity. The mesh also speeds recovery times over other methods and and reinforces the tissue; patients can often be mobile again within a matter of days. An Ostomy certainly increases the risk of a hernia. Discuss with a doctor and nurses for the facts and tips to manage your individual stoma – even if you do not recognize any pain. As with any hernia, this lessens the chances of developing a more cumbersome and large hernia requiring surgery. Can the parastomal hernia rupture? I have been informed by the stoma nurse that I do have a hernia very close to where I have a stoma. I have tried a stoma belt without much success. I am having another belt delivered, but I am concerned that this will not solve the problem I have. How do I spot any complications before it is serious.or to late? Does having a hernia put on weight? My weight has gone up since I had a colostomy seven months ago. The hernia developed two months ago. Since then my weight has gone up further. I have a hurnia atatch to my stony! It makes my left side some much bigger ! I look 7 mons preagnet! Is this surgery a high risk for a 91 year old femal? My Surgeon just told me I have a parastomal hernia and need surgery but the re-occuring rate is mostly possible. Is this true because I am in great pain and stoma does not look well. Perastomal skin is very thin around the stoma. I had my ilesotomy over 3 years ago. thing was wrong (as behind the colostomy was huge). Just waiting for surgery. Thank you again, as now I have a better understanding.